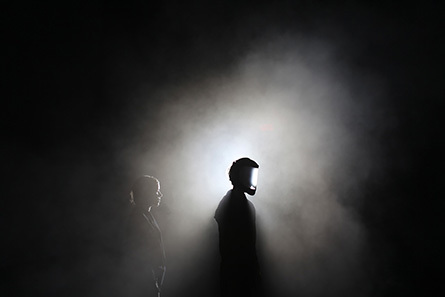 TodaysArt festival dedicated to visual arts, audio-visual performances, and electronic cultures founded by Olof van Winden is celebrating its tenth anniversary this year. After residing in the city centre of The Hague for nine years it has now moved closer to the edge of the North Sea, notably with an exhibition entitled "The Fluidity Aspect". The exhibition "The Fluidity Aspect" organized by curator Petra Heck takes place a few meters from the beach. Precisely where the artist Constant Dullaart has covered the entire wall of a room with "Jennifer in Paradise." But who is this Jennifer, photographed from behind on a beach who the artist has literally relentlessly worked over with a "Fluidity" filter. We learn through the source code of the page jennifer.ps, which is also dedicated to her, that her name is Knoll and that the photo accompanied the first distribution in floppy disc format in 1987 of Photoshop. So much for media archaeology. As for the young woman, she married one of the developers of the leading image processing software, and so also become the first to have been "Photoshopped". There are to date over 64,000 results on Google for this query. The application having progressed since 1987, there is even a tutorial on YouTube to explain how to turn a Pepperoni pizza into a model in a bikini. Re-appropriating and photo editing in art are not new, but they have gradually become everyone's business. To the point that beauty, like the strange, only reveals the manipulations in images we see circulating on the Internet. Though a photograph may capture the real, its treatment is moving farther and farther away from it. Deposits of unsorted garbage of the past are more valuable in the eyes of archaeologists, than are monetary treasures collected over time, for they enrich our knowledge of the daily life of those who preceded us. The trash on our computers, from the desktop to the Internet, is also greatly enriched with countless treasures. It is from this bottomless dump that the artist Jon Rafman supplies himself in creating the sequence "Mainsqueeze" (2014). The samples he assembles are comparable to those whose links we exchange through social networks. When they are augmented, comments such as amazing or disgusting, allow us to keep our distance. How many of us have recently entered terrorism or execution in this regard? To the irony and despair that is spreading through servers, the Canadian artist adds some historical and pictorial representations of human cruelty. But is it desirable that archaeologists of the future look at this work of video sampling that represents us without censorship or editing? The Louvre, the most visited museum in the world, allows still photography while prohibiting the use of flashes or tripods. As for the pictures of the institute's website, they are all protected by intellectual property law. It is therefore necessary to come to Paris, just as one formerly went to Rome. But it is not necessary to go to Lincoln, UK, to appropriate the sculptures of the Usher Gallery because they opened their doors to the contemporary artist Oliver Laric so that he could scan the collection in order to distribute it, online, in three-dimensional models. The project is called "Lincoln 3D Scans" and it is full of 3D files that we can all handle, edit and / or print. The stereo-lithography that is presented in The Hague is only one component of the work which is in the form of a resolutely participative website. 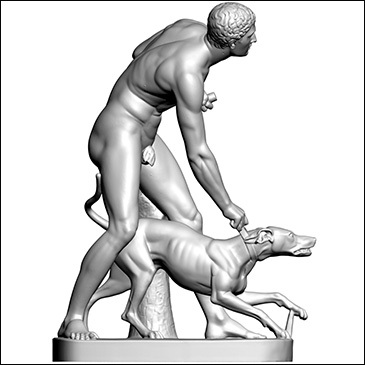 The history of art is full of discoveries and innovations of all kinds and there is no doubt that technologies like scanning three-dimensional printing, which is being perfected by being democratized, are forced to change our perception of sculpture without actually making any of us sculptors. 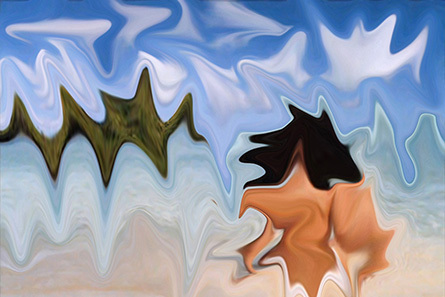 There are in this journey, going from the image to the object, rather strange assembly proposals among which we note "Transcend" (2012) by the artist Kianoosh Motallebi. 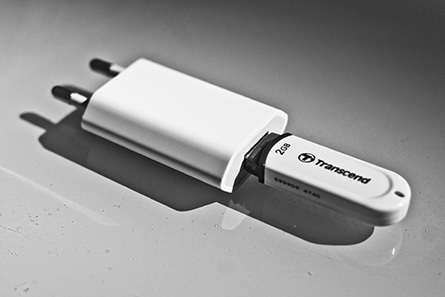 Two objects symbolizing the digitization of the World - a USB key and a 12v charger - fit together perfectly. And it is in this case, the very uselessness of the overlapping that makes sense. A little further, a refrigerator with the door wide open faces an electric heater. This provocation by Charbel-Joseph H. Boutros is entitled "My answer to ecology # 2" and dates from 2011. Both devices whose unnecessarily consumed energy cancel each other out, confront the viewer with their responsibilities. The average citizen, rather than politics, is situated precisely between these two devices in the face of a duel without foundation or future. This installation encourages us to reconsider our share of responsibility, commitment, and involvement in everyday life. When alone, we must humbly participate in changing the world. And then, in another room, there are hammers that have been connected to a server by artist Stefan Tiefengraber. As for the spectators, they have a great responsibility to choose whether to activate the work entitled "User Generated Server Destruction" through an online interface. Because with a click, they can release the hammers which, two by two, then hit the server hosting the application that controls them with all their weight. Should one activate this piece to destroy it, or refuse, without acting to preserve it intact? It is perhaps the dilemma here that comprises the work, more than the apparatus itself. One recalls another piece by Jonah Brucker Cohen from 2003 entitled "Alerting Infrastructure!” which does not call for its own destruction, but for that of the instruction it hosts. Another tool, a power drill, is also connected to the remote server allowing the public to activate it from a distance and consequently participate in the degradation of the institution. But what could cause the destruction of an art work or degradation, by the art work, of an institution? Unless it is the variability of the media they comprise that prohibits them access to institutions that the market controls. Uranium glass is a glass in which a small amount of Uranium has been incorporated. Especially appreciated in creating crockery in the late nineteenth century, its production disappeared during the Second World War. 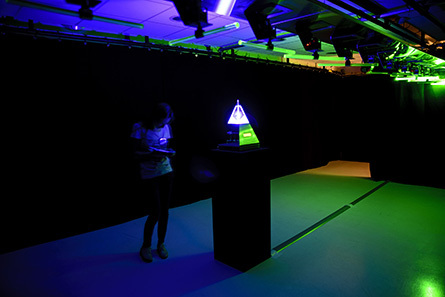 The origin of its fluorescence, in The Hague, is not very reassuring for viewers of the lumino-kinetic installation "Lead Angels 1.0" (2014) by Frederik De Wilde. It is bathed in ultraviolet light that reveals its usually invisible radiation. Are not the big contemporary fears also those of the invisible? The convolutions of Uranium glass tubes are harmonious just like the scrolls of mushroom clouds. For there is, even in extreme toxicity, a form of beauty. 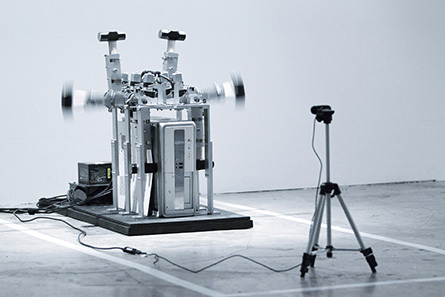 But the Belgian artist goes further when he offers the public the opportunity to act on the device by powering it with a variable amount of uranium salt. The radiation, though infinitely small, is magnified by the staging that raises questions about this kind of energy, the control of which sometimes eludes us. “Ilinx", designed by Christopher Salter, TeZ and Valerie Lamontagne, is an experience that has to be planned in advance because you have to sign up to experience it with only four participants at a time. But it is also a performance that requires lengthy preparation by donning a suit that we imagine conceals various technologies, but that we are unable to identify. Accompanied by a mediator and equipped with a helmet visor that deprives us of the contours of all shapes, we enter the space of the work whose limits are indistinguishable. Comfortably seated, we perceive distant sounds while the suit begins to vibrate in several spots at once. Our sense of sight being impaired, we then focus on the music of this multitude of variations of the intimate. It is our resonating body that as a whole, seems to be literally run through by the substance of the work itself. Yet it is precisely this "turmoil of the senses" that the three artists are aiming for with this performance entitled "Ilinx" - Greek for vertigo - a reference to the research of French sociologist Roger Caillois. 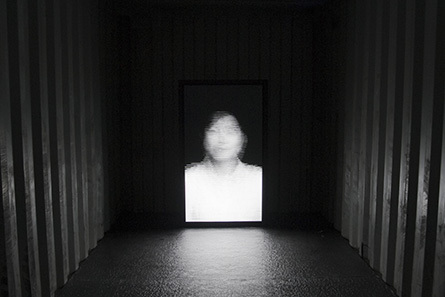 Finally, in the darkness of an exterior black box, there is the video installation "A versions [26 unknowns]" by Norimichi Hirakawa presented by the Japan Media Arts Festival. One can perceive the faces of women rapidly appearing the one after the other. Myriad horizontal lines in the frame blur the image, giving it a unity of style over time. As if it were an infinite transition merging the portraits of those who have previously looked into the lens of the artist's camera in his studio. But here, now, the machine having eradicated all forms of difference, they become but a single person. The sum possibly of all the women of the world from which emerges a relative serenity. In the darkness of the image space, they together address all viewers in silence. Resigned, perhaps, as are those who do not have the right to speak freely for some reason that only men, fathers and husbands know. Written by Dominique Moulon for MCD and translated by Geoffrey Finch, October 2014.